Aggressive, multi-purpose blade that can be used as an axe, a machete, or knife to fillet your way through any walker offensive. In battle, the extra-grippy rubberized handle keeps the blade securely in hand. Also a great machete for clearing brush, blazing trails and chopping branches. 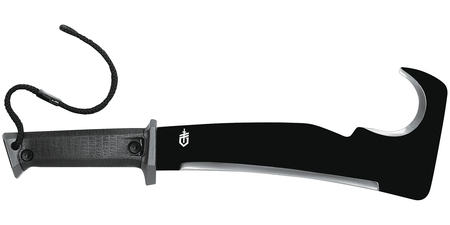 Overall Length 16.5 inches, blade Length 10.5 inches, weight 18 ounces. Head: high carbon steel, handle: high carbon steel. Handle: Gator-Grip.